An Energy and Environment employee practices using the AED equipment. Photo by Carrie Searcy. Safety is a yearlong pursuit at the Energy and Environment Cabinet (EEC), but June 1 marked the start of National Safety Month. To highlight its importance, safety tips were sent out weekly to Cabinet employees by the Training and Development Branch (TDB). Mark Kennedy talks with TBD employee, Kristy Hicks. Photo by Carrie Searcy. The weekly messages gave safety tips about slips, trips and falls; distracted driving; overexertion and ergonomics and finished the month with summer safety advice. The June safety tips, however, are only a small piece of the safety training that EEC does for its employees. Cardiopulmonary Resuscitation or CPR classes, given through the American Heart Association, are a key safety program. 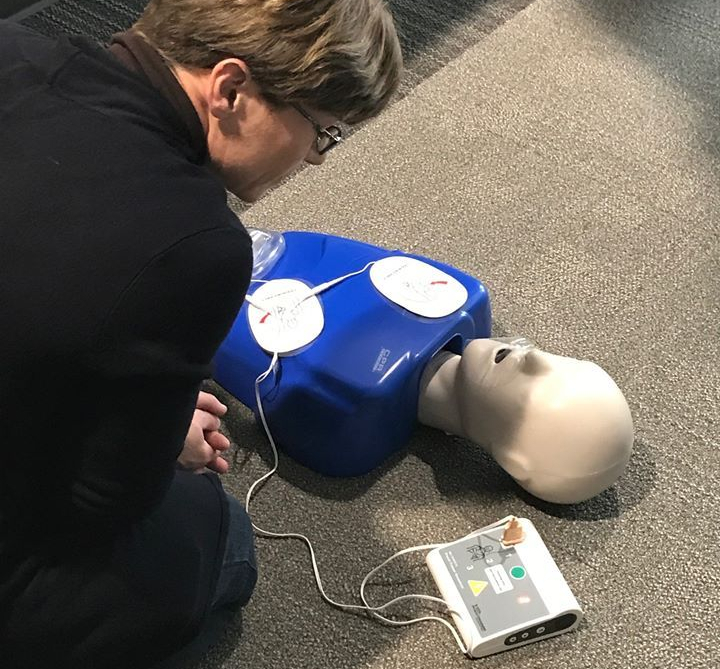 Hundreds of employees get yearly training on first aid and how to use the automated external defibrillator or AEDs that are posted throughout the building. According to Alan Coldiron, who was the safety coordinator for TDB for the past three years, immediate lifesaving measures can double or even triple the chances of survival after a cardiac arrest. The safety training EEC employees have received, have not only been used at work, but also in their personal lives. The one-day class teaches not only CPR, first aid and AED training, but also children and infant CPR and even how to administer naloxone in cases of an opioid overdose. Alan Coldiron (top right) teaches the opioid section of the CPR, AED and First Aid classes. Photo by Carrie Searcy. These issues cover broken limbs, heat exhaustion, hypothermia and even bee stings to only name a few. According to Coldiron, the classes are focused on really drilling information into employees that safety is a key component in a safe working environment for everyone. Safety however, plays only a small part of what the TDB does and has planned. According to Kennedy, there are many new programs coming to EEC. Programs like an in-house new employee orientation, a leadership academy, an onboarding program and even the new Cornerstone program, which will host the new application process for applying to open state positions.